Following on from the office lunch recipe for Citrus Salad with Salmon and Avocado I shared recently, here is a lunch box idea from James Ramsden, who has teamed up with SQUASH’D, the portable squash by Robinsons, and Nutritionist Jenny Edelstein from Brain Food, to create a series of lunchtime recipes. 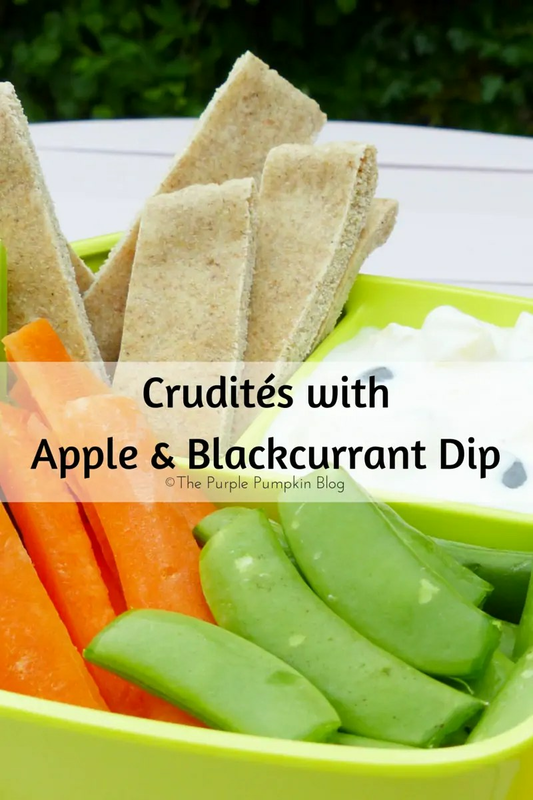 Today’s recipe is for Crudités with Apple & Blackcurrant Dip, which you can pack for your kid’s lunch boxes for school – or even for yourself! SQUASH’D is a 66ml capsule of high concentrated squash. It is available in six flavours: Apple & Blackcurrant, Orange & Peach, Tropical, Citrus, Summer Fruits, Pear & Blueberry. Available in all major supermarkets, RRP £2.49. Core and peel the apple and cut it into small cubes. Mix into the yoghurt with the blackcurrants, vinegar and salt. Cut the pitta into strips. Peel the carrots and cut into batons. Cut the celery into batons. Place the pitta and vegetables into a container alongside the dip. Enjoy with a refreshing glass of SQUASH’D Apple & Blackcurrant.